The most forward-thinking smartphone and the most colorful iPhone yet are finally available at Smart stores nationwide. Smart stores are filled with availers of the iPhone 5s and iPhone 5c a day after Smart’s simple launched the 2 phones at Powerbook BGC 3 weeks ago. Carag adds that the growing popularity of LTE devices has also made people realize the importance of a reliable network in optimizing the features of the new iPhones. “Aside from offering many affordable plans that make the new iPhones available to many, Smart, through its widest LTE coverage in the country, also delivers the fast and reliable network performance that the iPhone 5s and iPhone 5c need to maximize their use. Smart is simply the smart choice for these new iPhones,” Carag said. 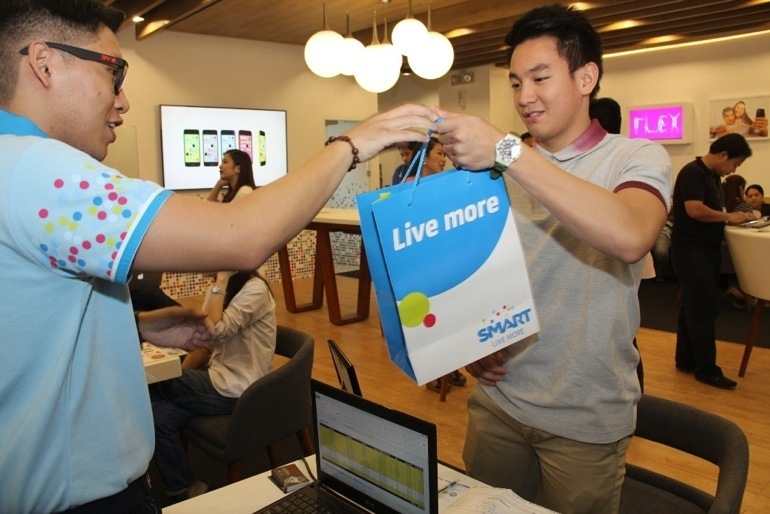 Some celebs and bloggers proved Carag right because they too availed the latest iPhone from the Smart Communications. A number of celebrities squeezed time into their hectic schedule and headed to the nearest Smart store to get hold of their new handsets. 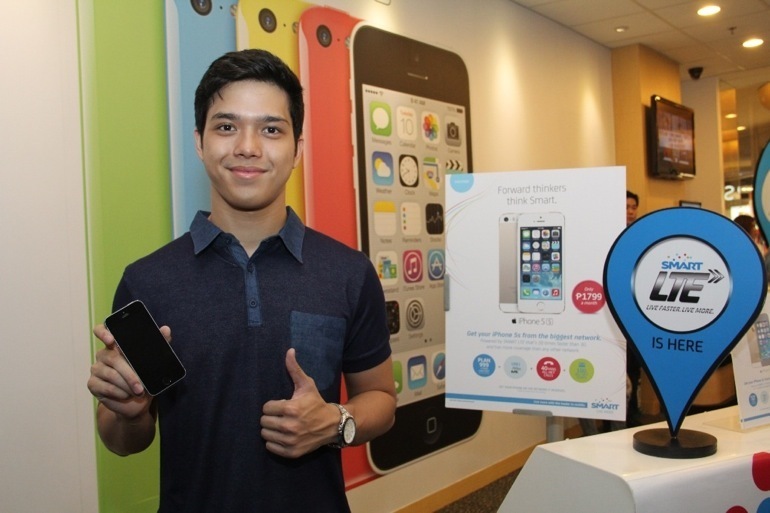 Rapper and actor Elmo Magalona went to the Smart store in Rockwell to pick up his spanking new iPhone 5s. “I’ve always liked the portability of iPhone and its user-friendliness,” said Magalona, who admitted to be a heavy user of Twitter, Instagram, Snapseed and other photo apps during downtime in recording sessions and taping for shows. On the other hand, DLSU Green Archer Thomas Torres was among the first to get his brand new iPhone5s at the Smart store in Robinson’s Magnolia. “I’ve always been an Apple fan so I’m among those who just couldn’t wait to use the new iPhone,” said Torres, who also considers himself a heavy user of social apps. “I use Twitter, Facebook and Instagram quite a lot, and to be constantly engaged, I need a trusty LTE connection. Smart gives me that,” he added. Not to be left behind, the coolest guys on the airwaves, Boys Night Out DJs Sam YG and Tony Toni, also headed to the Smart store on the first day the new iPhones became available. Fashion blogger Camille Co also went to the Smart store in Rockwell to get hold of her new iPhone. Like Co, fashion blogger Patricia Prieto got her new iPhone 5c from Smart. “Smart gives me the mobility and flexibility I need as a blogger who needs constant connection to several social media platforms,” she said. I also availed of the iPhone 5s from Smart 3 weeks ago. In case you missed it, I posted an unboxing and my first impression of the most forward-thinking smartphone here.